While DPT Laboratories specializes in developing and manufacturing CLOGSScreams, lotions, ointments, gels, oral and topical solutions and suspensions – their processing methods concentrate on unclogged production efficiency; so much so that, in 2000, the company produced more than 100,000,000 product units. Appearance counts, too. It applies equally well in satisfying packaging requirements, as well as in meeting industry regulated and self-imposed sanitation requirements. At DPT’s modern 125,000 sq. ft. production and packaging center in San Antonio, Texas, the requirements for streamlined efficiency and uncompromising cleanliness presented special challenges to address product quality and appearance. Installation of six Dorner low-profile conveyors effectively move processed and packaged products within the center. Five 6100 Series conveyors work in tandem in the packaging area. 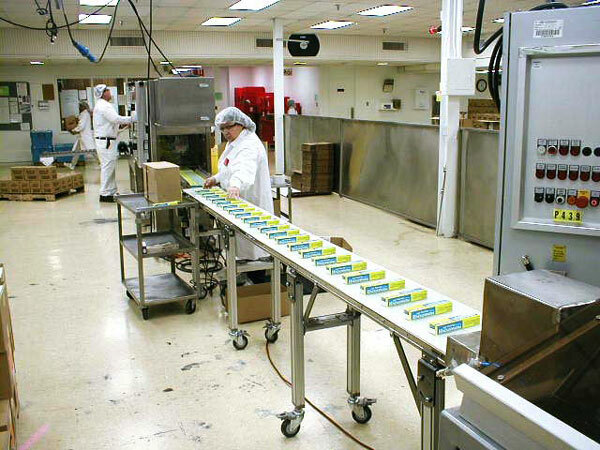 Two of these conveyors move small packaged products past detectors, which assure labels are properly positioned on containers. Three additional 6100 Series conveyors feed product onto the plant’s scales for automatic weight checks. Specially designed to meet the application requirements of the food, pharmaceutical, confectionery and other process industries, the low-profile 6100 Series conveyors feature a rugged, easy-to-clean stainless steel frame and special design innovations that maximize productivity. DTP has registered productivity gains, along with significant decreases in the number of rejected lots due to missing labels. The company also benefits from reduced routine maintenance requirements. Exclusive v-guiding keeps the conveyor belt firmly in place and eliminates the need for time-consuming adjustments. The outcome: better product quality, reduced waste and greater production volume.